The endoscopy room is of course the central element of the endoscopy suite. Endoscopic surgery is essentially performed under clean, but not sterile conditions. The endoscopy room where laser resection is performed must be equipped for general anesthesia with suction and oxygen delivery capabilities. In addition to the endoscopy room, the interventional endoscopy suite should include a recovery room, a patient receiving area, and a sterilization room. The endoscopy room is best visualized as consisting of three independent areas centered around the operating table. 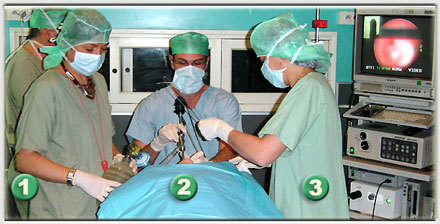 Area 1 to the patient’s right is the anesthesiologist´s domain. Area 2 at the head of the operating table is the endoscopist´s working space or operating field, and area 3 to the patient’s left accommodates the nursing staff who will assist in the procedure. 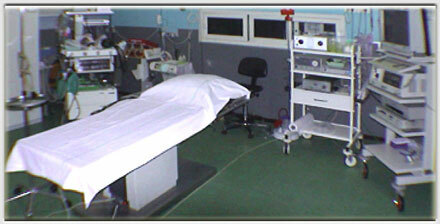 The anesthesiologist´s area must contain a storage cabinet for anesthesic drugs and monitoring and resuscitation devices. In area 2, the endoscopist should sit at the head of the operating table on an adjustable chair. Light sources, a storage cabinet for endoscopes, and local anesthetic agents (saline, xylocaine, adrenalin, and lens cleaner) should be within reach of the endoscopist. A cleaning area with a sink should be available in area 3.